"Paradoxum" means "contrary to expectation" and in this case refers to the fact L. paradoxum could be placed with equal justification in either Lilium or Nomocharis. Discovered in 1947, L. paradoxum grows from 8 to 18 inches in height with its leaves are presented in whorls. Noted is that the whorled, broad leaves are not seen in any other of the Himalayan or Western Chinese species. Only true Martagons and North American species are the other species known for their whorled leaves. This is a lilium species that is not easily reached. Requiring numerous sets of documents for crossing into different regions and dealing with populations sometimes hostile to outsiders, it is not for the faint of heart looking for an easy drive up to a beautiful lily. Our photo is courtesy of Alan Mitchell and comes from the back cover of the RHS Yearbook - Lilies and Related plants. 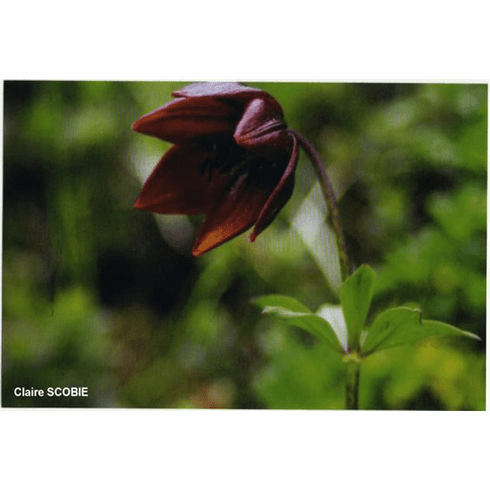 Alan reported that Claire Scobie, a freelance journalist photographed this extremely rare lily in 1987 at an elevation of about 14,000 feet (4.300 meters) or the equivalent of being atop Mt. Rainier in Washington State. Used with RHS permission.